Did You Know: Less than 1% of the 1966 population of Bobwhite and Vesper Sparrow exist in the state of WV today. Grassland nesting birds are in trouble! The numbers of these birds have dropped precipitously, many losing 80% of their population in the past 50 years. Habitat loss, land use practice changes, pesticides, and other unknown causes are all conspiring against these wonderful birds. 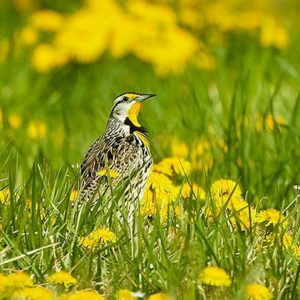 The Grassland Birds Initiative is designed to provide landowners with the knowledge and tools to help grassland birds. By providing high quality habitat, which will not be disturbed for the nesting season, we are giving these species a desperately needed last chance at survival. How many pastures and agricultural fields do you remember from your youth are now housing developments, shopping centers or parking lots? Habitat loss of breeding ground is a big part of the problem. Even more insidious are the changes in agricultural practices that have occurred over the last few decades. Earlier cutting of hay fields along with repeated cutting of the same fields during the growing season create a no-win situation for grassland nesting species. 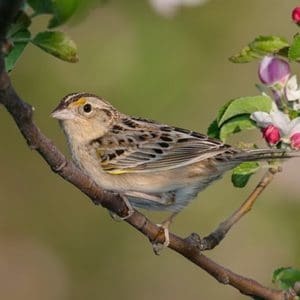 Many of the sparrows and blackbirds that rely on grasslands for breeding require 2 weeks to construct a nest, another 2-3 weeks for the eggs to hatch and again, 2-3 weeks for the young to fledge and be independent enough to move out of the area. Cutting hay fields in late June, again in July and again in August doesn’t allow nearly enough time for these breeders to be successful. This practice of repeated cutting of fields also depletes the soil of precious nitrogen. In years past, fields were allowed to lay fallow for a season or two in order to recharge the nutrients in the soil. This also greatly benefited wildlife and our grassland nesting birds. Many feel that these birds can nest in the fence rows and rock breaks of these fields. However, studies have shown that these restricted areas, many oriented in long continuous lines, are more effectively patrolled and hunted by predators such as the red fox. This increased pressure from predation is just as deadly to breeding birds as the cutting of the field. Enroll your property into the Grassland Birds Initiative program with PVAS and display your “Grassland Bird Preserve” sign for others to see. Practice reduced mowing; rotational mowing, late season mowing, or only mowing every four to five years to maintain a functional grassland ecosystem on lands that are not in production and to keep woody species from encroaching. Plant and establish warm-season grasses that are more beneficial to wildlife. Cooperate within the community to preserve and protect other grasslands for wildlife, using your project as a model for others. Coordinate with other land owners to attempt to link grasslands into larger tracts to increase the effective acreage of appropriate habitats. Cooperate with state and federal programs to offset costs associated with grassland preservation. Increased success of grassland nesting birds. Possible return of species that have disappeared from our area. Reduced fuel usage and reduced wear and tear on equipment. Establishment of a functional grassland habitat that benefits a host of plant and animal species. Reduced negative impacts from over-use of the soil. Increased fertility of the land. Help to ensure that future generations can experience and appreciate the wonderful birds and wildlife that make grasslands their home! rgeous song sounding like, “Spring of the Year!” Listen for this male to change song types while he is trying to attract a mate. Once a common inhabitant of our fields and pastures, the Eastern Meadowlark is becoming a rare bird in our area. Early cutting of hay fields is the most detrimental factor for a number of our grassland birds. Eastern Meadowlarks require fields to remain un-mown through mid-July. the evening. This was the genesis of their name; they seem to be singing vespers at the end of the day. 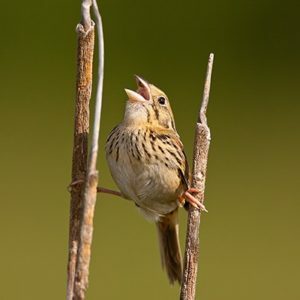 Their beautifully whistled songs are complex – composed of many different syllables. Vesper Sparrows require some bare soil within the fields where they will nest. Due to this need, they seem to be confined to soybean fields and young orchards. he Henslow’s Sparrow. 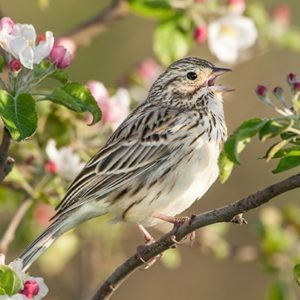 He appears to sing, “tsik-up!” The song of the Henslow’s Sparrow can be heard from first light well into evening twilight as males seek a mate. Bobolink in late afternoon sun. 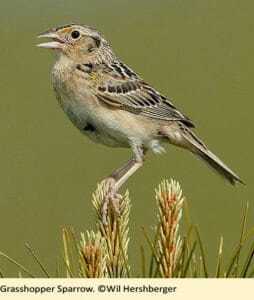 The song of the Bobolink has to be heard to be believed. A riotous explosion of notes pours forth from these striking males leaving one wondering, “When do they breathe?” Once one male starts to sing others near him will instantly join in. 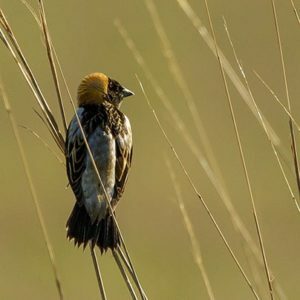 Nomadic in nature, the Bobolink requires that fields remain un-mown from late April through mid-July. They are fond of taller grasses and will nest in areas of transition from wetter to dryer conditions. 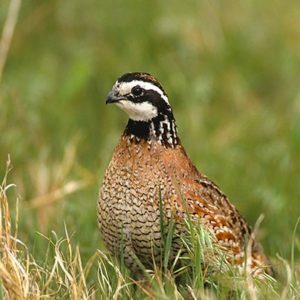 e plaintive whistles of the Northern Bobwhite are now rarely heard. The emphatic, “poor-Bob-WHITE!” was always a delight to hear on dewy summer mornings. There are only a few places left in the eastern panhandle of WV where this song can be heard. With the right land management we could return Northern Bobwhite Quail to our area and once again hear their comical songs. es has been a favorite game-bird of rural hunters for many decades. Their brief, harsh calls, “kork-kok!” used to ring-out over the fields and pastures all around our area. Early haying destroys this species’ nests as well as killing sitting hens. 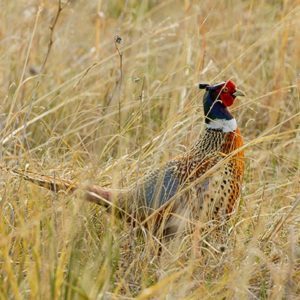 Waiting until late July to harvest hay would go a long way toward protecting our few remaining Ring-Necked Pheasants. grasshopper ratcheting away in the fields, “pi-tup-zeeeeeeeee.”. The song is easily overlooked, but with a little training you’ll be able to recognize this species when you are in their habitat. Once a common breeder in our area, this species is also disappearing due to early hay harvesting and loss of habitat. They are tolerant of light grazing of the fields where they nest, but require that the fields remain un-mown though mid-July.